Five candidates for governor meet Monday night in Burlington. From left: Phil Scott, Sue Minter, Matt Dunne, Bruce Lisman and Shap Smith. Vermont has many examples of homegrown entrepreneurial businesses. The five candidates for governor had no trouble reeling them off one after the other Monday night as each candidate tried to prove he or she was the right person to foster more of them. They touted Ben & Jerry’s, IDX, MyWebGrocer, Dealer.com, Seventh Generation, Concept 2, Alchemist Brewery, Lost Nation Brewery, (and all of Vermont's world-class beer) and Skida ski hats. 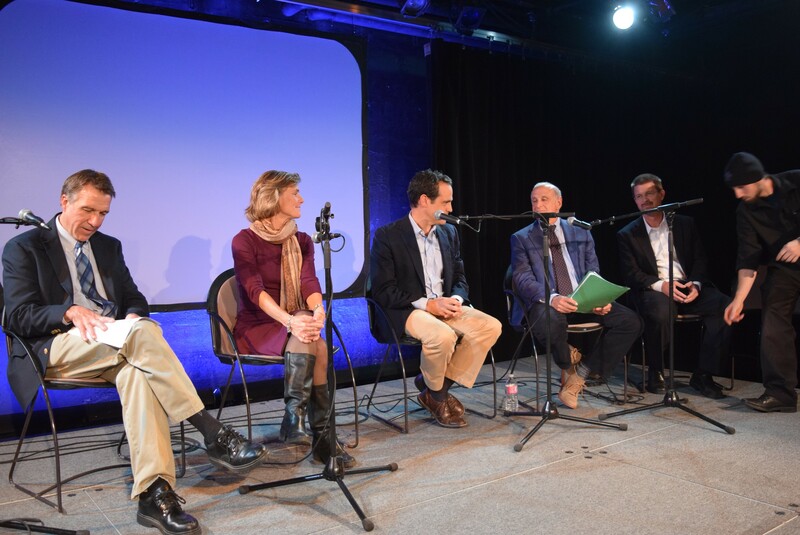 Each candidate tried harder than the next to talk up Vermont's entrepreneurial spirit. What would they do to help launch the next Ben & Jerry's? The three Democrats and two Republicans tried to persuade an audience of about 100 at the Flynn Center in Burlington that they have the answers. Each was a little nervous and a little brash while ushering in the start of what promises to be a long campaign for the open seat. 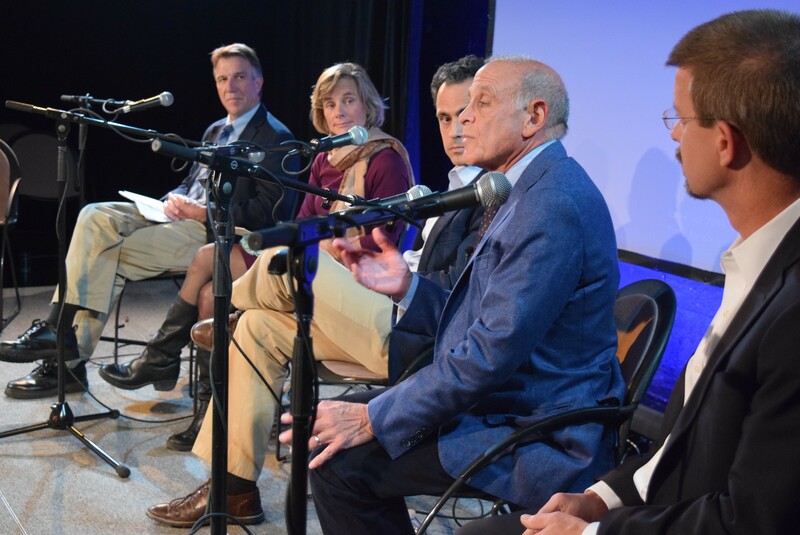 More than a year before an election in which Vermonters will choose a new governor, this marked the first time all five declared candidates shared the stage for a campaign forum. The occasion was Gov Pitch 2016, an event sponsored by FreshTracks Capital and the United Way of Chittenden County. Candidates were tackling many of the same issues that have challenged their predecessor, retiring Democratic Gov. Peter Shumlin: how to keep young graduates in the state; how to ensure everybody who needs it has high-speed internet; how to train workers for the jobs in demand; and the most effective incentives to attract businesses. The candidates for governor wait for the forum's start. Matt Dunne, a Democratic former state senator and Google manager, called for creating a Green Mountain Innovation House where entrepreneurs could live and work while collaborating with area colleges. Dunne said his professional experience lays the groundwork for extending broadband internet “to the last mile,” allowing anybody who wants to be innovative to do so in their barn or garage. He argued the governor’s race will come down to “who can deliver on the promise of reinventing the economy of the state Vermont." Bruce Lisman, a Republican and former Wall Street executive, said that current state officials “don’t know our employers at all.” A business owner's choice of where to locate can make or break a community, he said, noting that Bill Gates chose Seattle over Albuquerque as Microsoft's home, “forever finishing Albuquerque and changing the direction Seattle would take." Sue Minter, a Democrat and former transportation secretary, emphasized her experience helping to solve problems. When Alchemist owners John and Jen Kimmich were establishing the brewery that now produces Heady Topper, Minter and other Waterbury town officials helped simplify the approval process, she said. Phil Scott, Republican lieutenant governor, called for government to help business without over-promising. He argued that Democrats currently in charge of state government and the legislature have created an unpredictable landscape for business. As they discussed single-payer health care, Scott said, "The duration of the debate went on far too long." Scott argued, “We seem to have a deficit of faith in our government." That, he said, calls for "strong, courageous leadership to build consensus." Smith called for putting bond money into expanding broadband to unreached areas, as the government did to extend electrical lines. He said companies should be partnering with tech centers to teach students skills for jobs that companies are having trouble filling.